While every food lover knows that tender asparagus tips represent the peak of springtime dining, thrifty cooks hate discarding the woody stems. Experiment with traditional practices like peeling the outer layer, chopping the inner stalk and adding the pieces to stir fries and pickles. If those dishes prove unpalatable, don’t despair. Several other uses, from culinary to creative, await the resourceful “sparrow grass” fan. The best way to deal with the somewhat woody texture of asparagus ends involves cooking them to a soft consistency before pureeing them into a creamy consistency. Television chef Mary Ann Esposito, host of public television’s Ciao Italia, makes “Asparagus Stem Soup” by combining the stalks of two pounds asparagus (using the tops for a more elegant dish and cutting the remaining stalks in half lengthwise) with one onion, one carrot, a handful of lettuce or spinach leaves, water or chicken broth (just enough to cover the ingredients in a pot) and seasoning to taste. Her simple method requires bringing the ingredients to a boil, lowering to simmer for 10 minutes, and using either a stick blender or traditional blender to puree the soup. “Asparagus is not a cheap vegetable, and I would hate to buy it and let [any of] it go to waste,” Esposito concludes. Asparagus stems make a useful addition to soup stock. Either add them to your preferred vegetable or chicken stock recipe, or make a simple Asian-style broth by sautéing chopped asparagus stems and several large pieces of ginger root. Add water and simmer the mixture for about 10 minutes. Strain the ginger and asparagus and use the broth to moisten noodles or to substitute for the liquid in an Asian chicken or tofu soup. 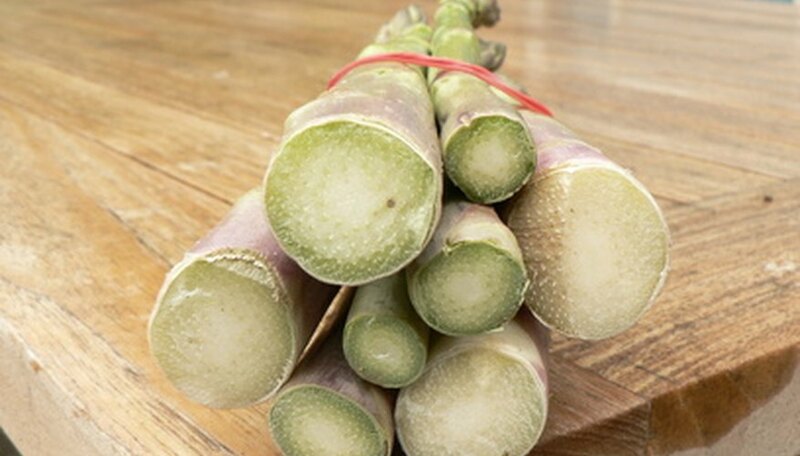 Asparagus stock custard helps reduce food waste, notes the website Cook for Good. The site focuses on conserving food resources, including easily overlooked asparagus ends. Combine the stalks of 1 pound asparagus in 2 cups of milk. Warm the milk over medium heat until it starts to foam slightly, cover and let cool. Substitute this asparagus milk for the milk or cream in your favorite savory custard or quiche recipe. This practice ups both the vitamin and flavor content of these egg-based dishes. If woody asparagus stems just don’t appeal to you as a recipe ingredient, add them to the compost pile. Vegetable peelings represent an important source of nitrogen for the garden soil. Combine asparagus stems and other vegetable scraps with cut grass and coffee grounds to create a nitrogen layer. Sandwich nitrogen layers between carbon layers comprised of materials like chopped leaves and hay. While the cellulose fibers in asparagus aren’t strong enough to make good paper by themselves, strips of asparagus stems add interesting texture and contrasting color when adding to stronger fibers. Use the tender tips for cooking, and reserve the woody stalks. Chop these scraps in the food processor, or peel a few dozen strands of fiber from the stalks. Follow the method recommended for the base material of the paper. A few handfuls of torn, non-glossy newspaper or junk mail only requires several seconds of processing in a blender that’s filled about halfway with water. Plant fibers, on the other hand, often require several hours of cooking time. Pour the processed fibers into a vat, add the chopped asparagus stems, and use a paper frame to form your sheets of paper. Follow the directions for sheet-forming that come with your paper frame or papermaking kit. Natural beauty expert Jeanne Rose suggests using asparagus stalks to help clear up oily skin and acne. Infuse the stalks in boiling water for several minutes, let cool and splash your face with the liquid. Alternatively, mash the cooked stalks with plain yogurt and use as a face mask.